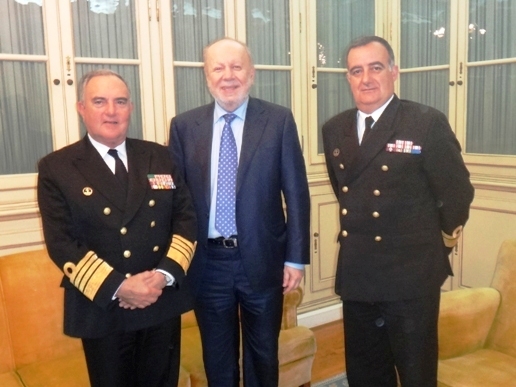 Ambassador Philippe J. Lhuillier calls on Admiral José Carlos Torrado Saldanha Lopes (left), Chief of Naval Staff of the Portuguese Navy on April 16, 2013 at the Navy Headquarters in Lisbon. Also in the photo is Rear Admiral José Luis Branco Seabra de Melo, his Chief of Staff. Ambassador Philippe J. Lhuillier paid a courtesy call to Admiral José Carlos Torrado Saldanha Lopes, Chief of Naval Staff of the Marinha Portuguesa (Portuguese Navy) on April 16, 2013 at the Navy Headquarters in Lisbon. During the meeting, Ambassador Lhuillier said that the Philippines and Portugal share the same interest to protect and preserve its extensive maritime jurisdiction. As an archipelagic country with a coast line of more than 36,000 kilometers, the Philippines carries the huge task of managing and maximizing the use of its vast marine resources. Admiral Lopes agreed with the Ambassador and acknowledged that the Navy covers an area of responsibility that is 63 times its land territory presenting a huge challenge for the 11,000-strong Navy. The Ambassador conveyed the gratitude of the Philippine government for the assistance provided by the Navy and the Air Force during medical evacuations at sea of injured and seriously-ill Filipino seafarers, mostly from chemical tankers and cargo ships transiting the waters off the Portuguese coast. Every year, the Philippine Embassy receives a number of reports about Filipino seafarers evacuated to the islands of the Açores and Madeira for emergency reasons.